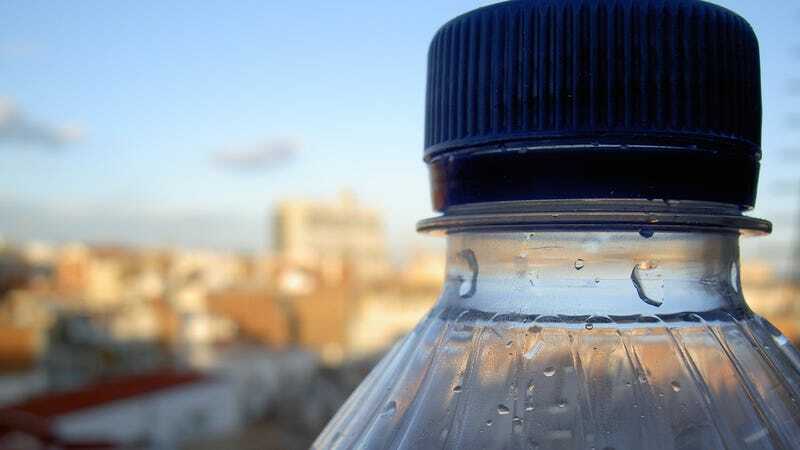 Testing of 259 plastic water bottles from nine counties revealed microplastic particles in water from 242 of the bottles, according to a new report. The test has prompted the World Health Organization to review the issue, though there is no firm evidence that the presence of microplastics would make bottled water unsafe to drink. There have been increasing discussions about the potential harm posed by microplastics, tiny plastic particles that have shown up in the oceans and in food chains. But new testing, done by nonprofit journalism organization Orb Media, found micrometer-sized plastic flecks inside bottles from brands you’ve heard of, including Evian, Aquafina, Dasani, and San Pellegrino. Orb’s researchers analyzed the water using a dye that binds to plastic, a method that two of the bottled water companies say is unreliable. For plastic particles in the 100 micron, or 0.10 millimeter size range, tests conducted for Orb at the State University of New York [Fredonia] revealed a global average of 10.4 plastic particles per liter. These particles were confirmed as plastic using an industry standard infrared microscope. The tests also showed a much greater number of even smaller particles that researchers said are also likely plastic. The global average for these particles was 314.6 per liter. What do microplastics do to the human body? Honestly, we don’t know yet. We know that fish eat it, and predators who eat the fish poop the plastic out. As for its health effects in humans, there isn’t really a lot of research yet, as several researchers have previously told Gizmodo. The Orb Media reports that 90 percent of the plastic is excreted, while some remains inside the body. How the plastic particles get in the water, folks don’t know. Perhaps from the air, researcher Abigail Barrows from a group called Story of Stuff told The Guardian. At least one paper has hypothesized that microplastics could induce immune responses by the body, and that issues could increase with chronic exposure—but that paper instead lays out a pathway of what kinds of studies are required to understand the issue. “Although there is potential for microplastics to impact human health, assessing current exposure levels and burdens is key,” the authors write in the paper published last year in the journal Environmental Science and Technology. Nestlé criticised the methodology of the Orb Media study, claiming in a statement to CBC that the technique using Nile red dye could “generate false positives”. Coca-Cola told the BBC it had strict filtration methods, but acknowledged the ubiquity of plastics in the environment meant plastic fibres “may be found at minute levels even in highly treated products”. A Gerolsteiner spokesperson said the company, too, could not rule out plastics getting into bottled water from airborne sources or from packing processes. The spokesperson said concentrations of plastics in water from their own analyses were lower than those allowed in pharmaceutical products. Danone claimed the Orb Media study used a methodology that was “unclear”. The American Beverage Association said it “stood by the safety” of its bottled water, adding that the science around microplastics was only just emerging. That all being said, no one wants to hear that there’s plastic in their bottled water. After Orb’s story came out, the World Health Organization announced that they’d be reviewing the risks of plastic in water as part of ongoing investigations, reports The Guardian. The question now is whether scientists will find anything in their own research, and whether bottling companies will make any changes. In the meantime, if you’re looking for reasons to stop drinking bottled water, there are plenty.